← Neanderthals in Genesis? Read for the answer. I am very glad that I had the opportunity to attend Dr. James Cone’s captivating lecture on Black Liberation Theology. Like I said in class last Friday, I have always been anxious to attend more left-of –center events on campus since I’ve been at UK and Dr. Cone’s speech was a quite satisfactory experience. Too often does Christianity have a right-wing connotation in America, with mainstream figures such a Mike Huckabee and Bill O’Rielly propogating the idea that social conservatism is in accordance with scripture. Dr. Cone and his philosophy of social justice are an inspiration to me that there are people who recognize the reproof to greed and wealth which the Bible incorporates. 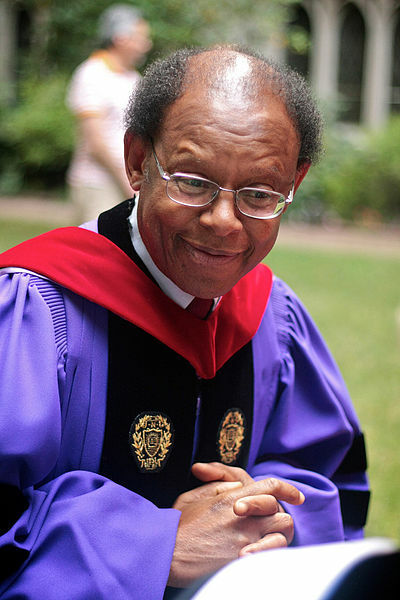 In my perspective, Dr. Cone’s lens of interpretation represents a theology that aligns with what mainstream political thought to be the more radical elements of the left spectrum, and represents the true application of the most literal interpretation of the Old Testament prophets which we studied in class. Working on a final project concerning Social Justice rhetoric in the Prophets and its modern applications, I found the philosophy of Dr, Cone to be incredibly useful to develop deeper insight into how the Old Testament Prophecies are regarded in context of contemporary socio-political issues.